Throughout the year, The Works Museum is a destination for thousands of students for school groups, field trips, and other engineering events. 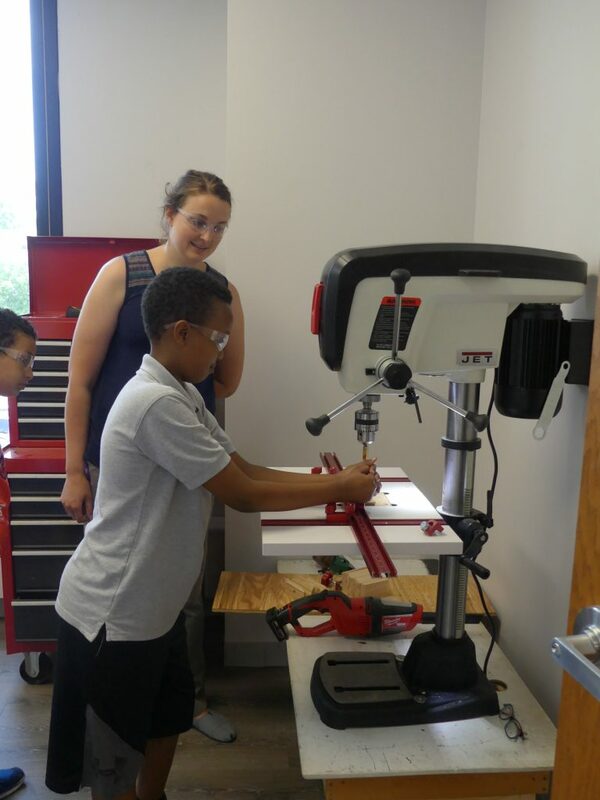 Recently, when Success Academy, a Bloomington elementary school with an “innovative STEM approach,” requested an immersive engineering experience for its students, we were excited to have a chance to dive even deeper into engineering with this enthusiastic group of students. Success Academy is unlike most elementary schools. The classroom experience frequently uses technology to help students learn from both traditional classroom and digital environments. Success Academy’s academic program specifically focuses on Science, Technology, Engineering, Math and Leadership. 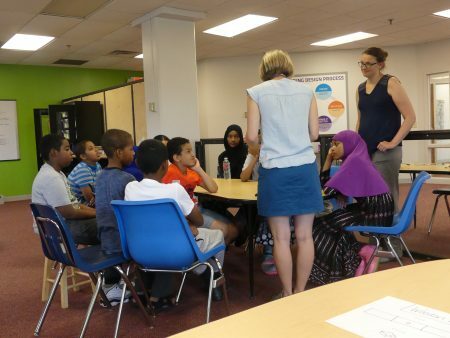 A group of eleven students in grades 5 and 6 came to The Workshop for four afternoons. Throughout the week participants completed a number of projects, each with increasing difficulty. The week ended by making circuit components. 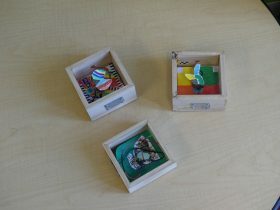 In these circuit pieces, a motor, switch, or lightbulb is installed inside a decorated wooden box. The new products will be replacing the old circuit connectors in the Museum floor. Beginning this fall, every visitor to the Museum will get to use and admire the work of these local students. 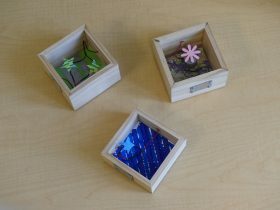 These wooden boxes may look simple, but they require many steps and skills to create and put together. First the wood must be cut, drilled, and sanded. The next steps are sanding the metal, cutting and striping the wires, then soldering the metal and wires. Only after prepping the materials can you assemble the whole box together. The Success Academy students learned each of these skills individually throughout the week and were able to put them all together to create a complete circuit box. The biggest tool the students used was the power drill, used for drilling holes in the sides of the circuit boxes. They were very excited and frequently asked, “Can I go next?” or “Can we do it again?” They compared the power drill to previous activities and tools to learn about how different tools produce different results. Several times the students shared funny moments when the drill clamp was so tight no one except Frances could undo it. 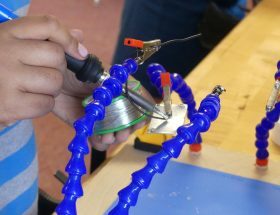 It was clear that the Success Academy students loved soldering. There were lots of calls of “I call that one!” as they made their way over to the soldering station at one end of The Workshop. 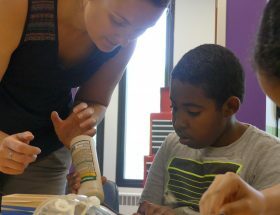 Megan, one of The Works Museum’s Educators, taught about safety and about the several intricate steps required in soldering. “But the hardest part,” she said, “is patience – waiting for the solder to melt.” (Full honesty: I had to ask the kids what “flux” is because I had no idea! It’s a cleaning agent that removes oxidation from metal to allow solder to bond to it.) Then everyone set to work soldering wires to metal plates. 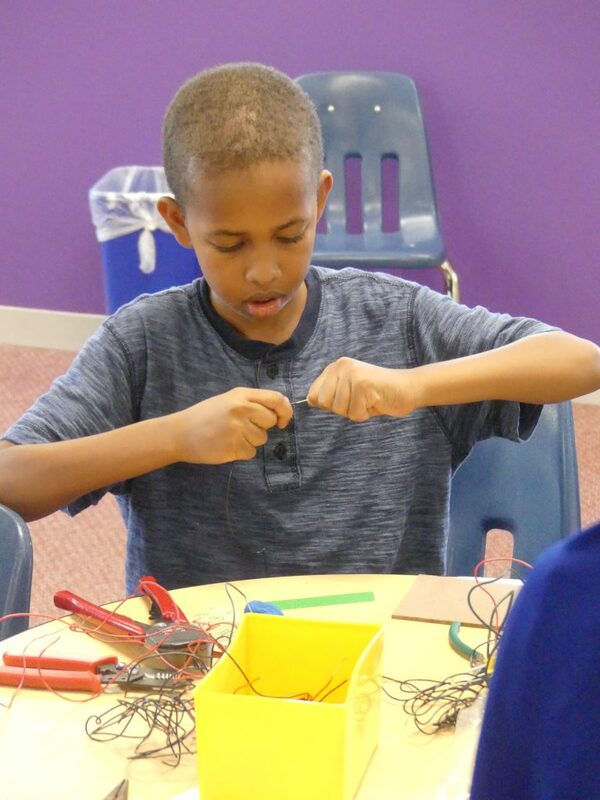 Throughout the week the students had a lot of fun with circuits. 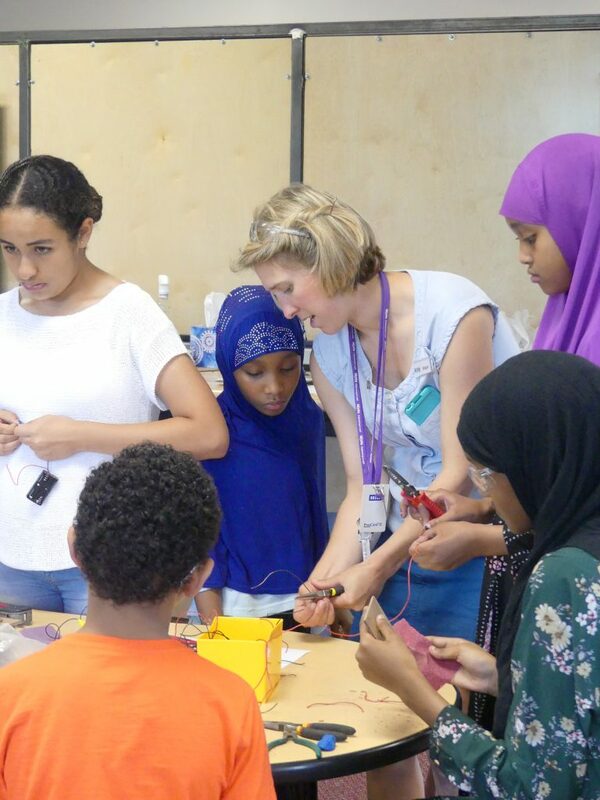 The Workshop’s director Frances described how students had a “literal lightbulb moment” when their lightbulb, buzzer, or circuit finally worked. 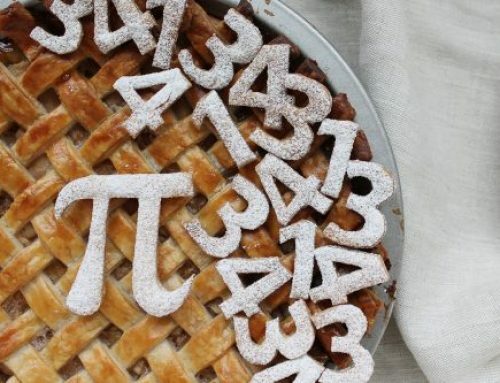 They were able to see what all their work had led to. 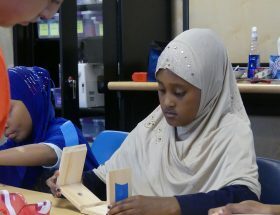 At The Workshop, these students learned how to be designers, builders, artists — in a word, they became engineers. The week was so successful that the same eleven students are coming back to the Museum in the first week of August.